The Village Bonfire and Firework Display has been running in the Village for the past 20 years or so. It has developed into one of the region’s biggest and best displays but still keeping its ‘Village’ feel. This is something the organisers strive to keep – a friendly, safe and real value for money event. We have been extremely fortunate to have living within the Village a Fireworks expert (The Firework equivalent of The STIG, we call him ‘John’), ‘John’ has designed and developed fireworks over many years. John is also is a special effects expert making many effects for Theme Parks and Movies also designing and building the National Beacon in The Mall to celebrate the Queens Diamond Jubilee. He was also very much involved in the special effects for the Olympic opening ceremony. Visit his company website to see his skills in action. John and his team build all this expertise in – providing the Village with what many say is the best display they have ever seen. LIVE MUSIC by G&T a local duo from Chippenham who many will have seen and heard there fantastic performances at local events. They will be playing before the Fireworks and again after. We also have the Chippenham Hulalahoopers to entertain you again http://hulalahoopers.com/performance/. After Fireworks – LIVE MUSIC – To avoid the Car Park Exit rush please stay and enjoy a pint and Burger, and warm yourself next to the Fire. Food and Bar prices will be reduced after the Fireworks. The End – Please leave carefully and make sure you take your children……. The Town Library, Regent Circus. There are two areas which are strictly reserved for Disabled/Blue Badge Parking – We ask you to respect these areas for those that require it. Anyone found parking without displaying the appropriate badges is liable to be clamped with a release fee of £100.00. Please follow the signs from the B4069 to the car park. 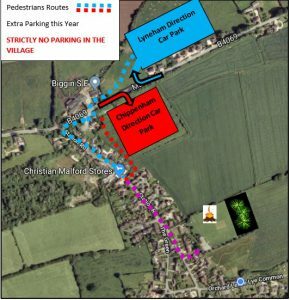 There is NO Parking within the Village this Year, we will be closing the road by the entrance to the Recreation Ground. Please follow the pedestrian route from the car parks as directed. There are Advance Ticket Express Entry Gates for ticket holders so please join the correct line and have your tickets ready. If you’re paying on the Gate please have the correct money as this will speed up your entry. Free Sparklers for Kids. Please don’t bring your own as we don’t allow Sparklers among the Crowd for obvious reasons. Please use our Sparkler Area where you will be given Sparklers free of Charge, with safe lighting and area for the Children to use them. Please bring gloves for your children. Children must be supervised. The Winner gets to press the ‘Button’ to electronically light the Bonfire in a spectacular fashion. There are also prizes for all that enter. We have a Control Trailer located next to the marquee and St John’s Ambulance next to the Pavilion for any lost or found Children. 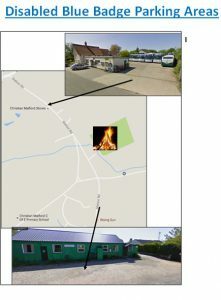 Please advise your children of the location of the Control trailer or if you have lost children please report it here. A superb BBQ cooked by the Friends of the School and Playgroup. The WI are serving Hot Soup, Toffee Apples, Gingerbreadmen and of course their warming Mulled Wine and Cider. We have a full Bar with Real Ales out of the Barrel all pulled by the Tug of War Team. If you just want a quick can of Beer, Lager Cider or Wine then we have ‘The Can Bar’ next to the marquee, this has a more limited choice of drinks but service is faster. We also have a ‘Kids Bar’ selling soft drinks, Sweets and lots of flashing, Glowing and Spinning things, again at sensible prices. Our special thanks to Christian Malford shop, The Rising Sun and Chippenham and Swindon Tourist Offices for all their help. 2016 – Watch the Show! Just so you can see how things have developed here is 2010 Finale, followed by the 2011 Finale and a small sample of video clips of some of the Fireworks that you will experience here and here! There are many more clips on You Tube if you want to search…. Some of our previous Fireworks have been posted by followers on Facebook – many thanks for these. Many thanks to Photographer Rick Martindale, who attended as a Spectator, for these photos.